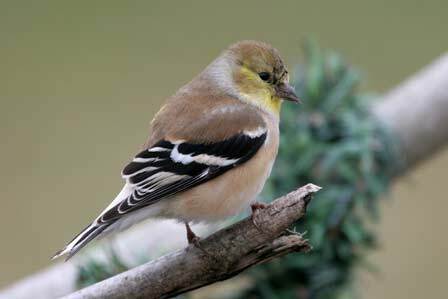 The American Goldfinch is a winter season resident in New Hanover and surrounding counties. In their breeding plumage, the male is an unmistakable bright yellow with black wings and a black spot on the top of his head. However, this species tends to breed more north and west of our area. In winter when they are most often seen here, they are a plain yellowish brown color with dark wings and two buffy colored wing bars. The females have more dull coloration no matter what season they are observed. They will also never get the black spot on the head like the males do. American Goldfinch are most often seen in flocks. They also tend to congregate around things that are yellow (like themselves). Wild Bird & Garden seasonally stocks a variety of specially designed goldfinch feeders (most of which are yellow). 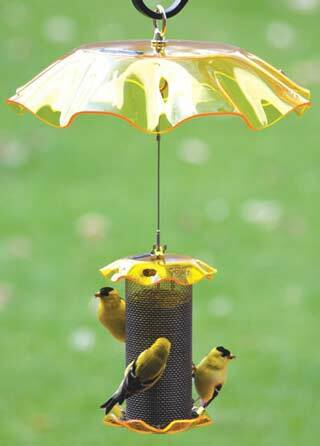 We also stock yellow weather guards to help attract these birds which help keep rain out of your seed as well. These birds are particularly fond of thistle and sunflower seed, but will also eat tree buds, other seeds, and insects. At Wild Bird & Garden, we stock thistle seed especially for this species (sometimes called 'Nyjer' seed in the store) as well as sunflower seeds. 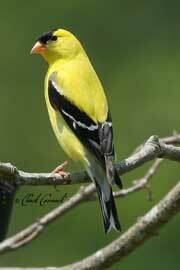 Adult Male American Goldfinch in breeding plumage.